Positions at the State Department have declined since Trump became president. Secretary of State Rex Tillerson offered a forceful defense against reports that he is gutting the State Department, saying he was "offended" by them. He challenged the numbers, accused some reporters of sounding "like the sky was falling," and argued the agency was "functioning very well from my perspective." But his critics -- a chorus that has grown louder and louder during the former ExxonMobil CEO's 10-month tenure as the nation's top diplomat -- dismissed and even ridiculed his comments, with some pointing out that his own numbers were off. The debate about his management has consumed his time in office and overshadowed any policy initiatives, with Tillerson himself calling his "redesign" of the department "the most important thing I want to do during the time I have." A week of particularly bad coverage was capped by a New York Times editorial by two retired senior diplomats who blasted President Donald Trump and Tillerson’s "deliberate effort to deconstruct the State Department and the Foreign Service." The words stung, particularly from Ryan Crocker and Nick Burns –- the former ambassador to Iraq and Afghanistan and the former Under Secretary of State under George W. Bush and ambassador to NATO, respectively. Tillerson rejected them after a speech Tuesday at the Woodrow Wilson Center in Washington, saying, "We’re keeping the organization fully staffed. ... There is no hollowing out." But he has also made it no secret that he is making cuts at the organization. He's instituted a department-wide hiring freeze and offered buyouts of up to $25,000 in an effort to thin the ranks through attrition. He announced his intention to eliminate dozens of special envoy positions and their offices in a letter to Congress in August. And he has worked with the Trump administration on a budget that slashes nearly a third of the organization's funding from the previous year. In particular, Tillerson downplayed staffing losses, blamed Congress for vacancies and defended the department's budget proposal -- all of which are part of his redesign to make the agency more nimble and sustainable for the 21st century, he says. That effort faced another stumbling block this week with the sudden departure of the woman leading it, Counselor of the Department Maliz Beams, just three months after Tillerson brought her on board. One of the central arguments against Tillerson has been the swath of departures of senior Foreign Service officers during his brief time, which Tillerson rejected as "false" and "wrong." He downplayed the departure of career ambassadors -- the agency's highest rank, equivalent to a four-star general. 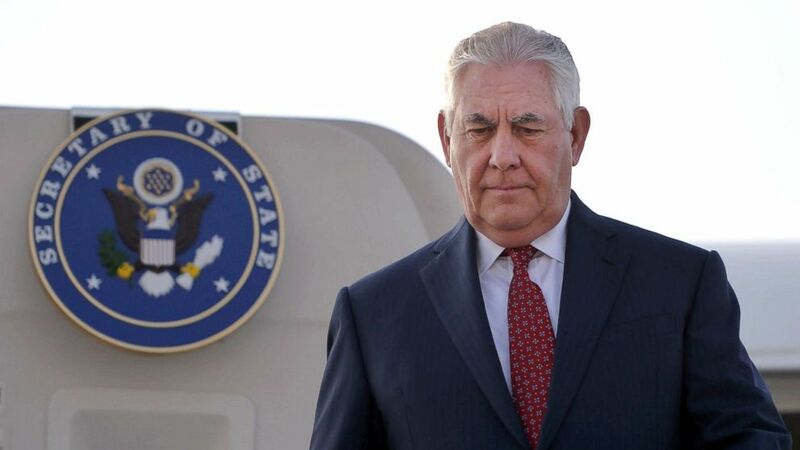 The American Foreign Service Association (AFSA) reported in a letter earlier this month by its president that 60 percent of career ambassadors had departed, which Tillerson said was misleading because, "We went from six to two... It sounded like the sky was falling." Still, the departures have given people pause. While there have only been 52 career ambassadors since the role was created in 1955, Samantha Power, a former Barack Obama adviser and U.S. ambassador to the U.N., compared it to Tillerson's Exxon days: "If 3 of 5 senior execs leave Exxon in span of few months, investors likely ask CEO what’s happening," she tweeted. Yes career ambassadors are rare - equivalent of 4-star General. If 3 of 5 senior execs leave Exxon in span of few months, investors likely ask CEO what’s happening. Tillerson, in part, cited their ages for the exits, saying, "They reached 65, they retired, they moved on." But of the four, two were not yet 65 -- Victoria Nuland, who departed after Trump was inaugurated, and Kristie Kenney, who was removed from her position as State Department counselor and left after she was not reassigned. A third, Anne Patterson, retired before Trump took office and was expected to be named Under Secretary of Defense for Policy, until the White House and two Senate Republicans reportedly opposed her nomination over Defense Secretary James Mattis's wishes. But Tillerson also neglected to address the broader point AFSA and others like Crocker and Burns have been making, that all of the senior ranks are being "depleted." Nearly half of career ministers -- the second-highest level and equivalent to the military’s three-star generals -- are gone too, down to 19 from 33, according to AFSA, and the next-level minister counselors have seen their numbers drop by 62 diplomats, to 369. 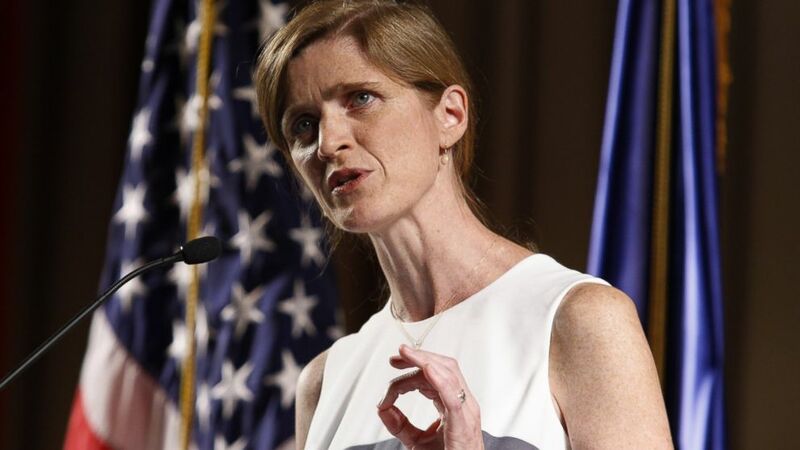 (NurPhoto/Sipa USA via AP) Samantha Power, the U.S. Ambassador to the United Nations, speaks in Kiev, Ukraine, June 11, 2015. In contrast to Tillerson's accusation that the numbers are "false," AFSA told ABC News that it received the numbers directly from the State Department's Human Resources Bureau. The union declined to respond to Tillerson's latest comments, but when the State Department previously disputed that AFSA letter, its spokesperson Ásgeir Sigfússon told ABC News, "We do not actually see a rebuttal of AFSA’s description of what is happening to the top ranks of the Foreign Service." Tillerson also blamed the vacancies and acting roles on an "excruciatingly slow" confirmation process on Capitol Hill. But staffers on the Senate Foreign Relations Committee, which oversee that process, disputed that idea. There are 163 Senate-confirmed positions at the department and its affiliated agency, the U.S. Agency for International Development (USAID), according to staffers, and more than half of those, 85 in total, currently have no named nominee. Of the 78 nominees put forward, 56 have been confirmed -- while 23 are still pending. One staffer blamed the Trump administration's own delays in filing the proper paperwork or working with the committee to schedule a hearing. But to Tillerson's point, the average wait time for confirmation for a Trump administration nominee, at all agencies, has been 69 days, compared to 50 for Obama and 35 for George W. Bush, according to the nonprofit Partnership for Public Service. (Aamir Qureshi/AFP/Getty Images) Secretary of State Rex Tillerson comes down from his plane upon his arrival at Pakistan's Nur Khan military airbase in Islamabad, Oct. 24, 2017. Some of the highest level positions at State are still vacant though, including four of the six under secretary roles, with a fifth filled by someone in an acting capacity. Of 24 assistant secretary positions, three are vacant, 16 are filled by someone in an acting role, and only four are Trump appointees. Tillerson defended those in acting roles for "doing extraordinary work" and added, "I’m offended on their behalf when people say somehow we don’t have a State Department that functions." He cited their travel with him overseas -- for example, by acting Assistant Secretary for East Asian and Pacific Affairs Susan Thornton, a longtime diplomat who is said to have a close working relationship with the boss. But the presence of these career diplomats has generated ire on the right, with conservative commentator Laura Ingraham telling Trump in a Fox News interview earlier this month, "There's a concern that the State Department currently is undermining your agenda." Trump seemed to agree, but reassured her that his vision would be implemented: "I'm the only one that matters because, when it comes to it, that's what the policy is going to be." Tillerson took on critics of his cuts to the budget too, arguing both that the department's previous budgets were "unsustainable" in their size and unnecessary because the administration is solving conflicts. "We’re going to have success in some of these conflict areas of getting these conflicts resolved and moving to a different place in terms of the kind of support that we have to give them," he said, arguing then that the State Department's budget can be cut. Critics seized on this idea as illogical and unrealistic. "Just when I think my capacity for surprise exhausted (11/28 edition): Rex Tillerson justifying reductions in State Dept $/personnel in part from expectation US is going to succeed in getting some conflicts resolved. Really? Which? N Korea? Ukraine? S China Sea? Yemen? Israel-Pal?" tweeted Richard Haass, the president of the Council on Foreign Relations and a top State Department official in the Bush administration. Just when I think my capacity for surprise exhausted (11/28 edition): Rex Tillerson justifying reductions in State Dept $/personnel in part from expectation US is going to succeed in getting some conflicts resolved. Really? Which? N Korea? Ukraine? S China Sea? Yemen? Israel-Pal? If anything, many of those conflicts require more diplomatic manpower than ever before, argued foreign policy experts like retired ambassador Laura Kennedy, who said she was "dumbfounded" by the remark. "My head's exploding again," longtime Middle East negotiator Aaron David Miller tweeted, as Slate foreign affairs columnist Fred Kaplan wrote, "This may rank as the silliest comment ever made by a Cabinet secretary." Said last night having worked at State for 25 years, my head's exploding. The damage will be felt not only in talent drain; but in attracting new FSOs. Fact is Tillerson's instincts on foreign policy are pretty good; his instincts on diplomacy aren't. Others questioned the notion that the budget was out of control, arguing that an increasingly fraught world requires more diplomatic efforts and more American engagement, especially as the Pentagon continues to see increases in its budget. There may be room to trim inefficiencies or redundancies, including many of the special envoys, but to cut so widely now would be "radical and reckless," as Sen. Lindsey Graham, R-S.C., who oversees appropriations for the State Department and USAID, said earlier this year. That budget was summarily dismissed by Republicans on Capitol Hill anyway. 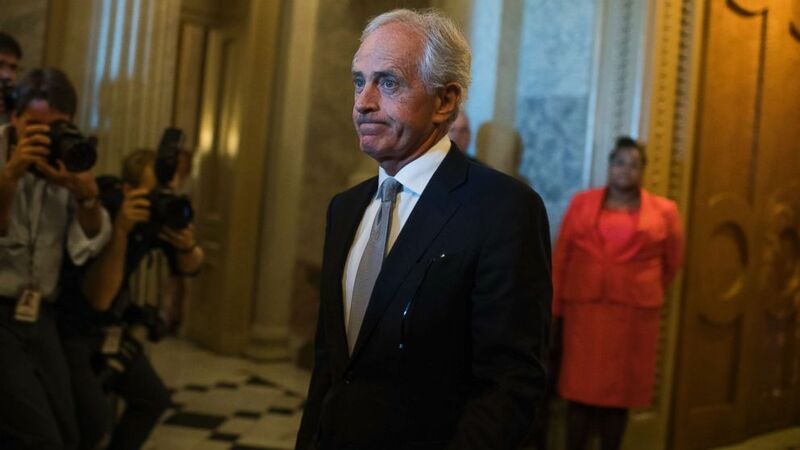 Sen. Bob Corker, R-Tenn., chair of the Senate Foreign Relations Committee and a Tillerson supporter, told him in June that he and his staff "began going through the budget that you're presenting today, and after about five minutes, I said, 'This is a total waste of time.'" Congress passed a higher budget for the department in the fall. Despite his impassioned argument, Tillerson has expressed bewilderment" at how the narrative of a crumbling State Department has taken root -- with the agency's spokesperson Heather Nauert acknowledging, "We have gotten certainly bad press." While she expressed regret "that that kind of narrative has taken hold," she dismissed it as "based on politics," although many of the retired diplomats are nonpolitical and some of the loudest critics have been Republicans on the Hill. (Tom Williams/CQ Roll Call via Getty Images) Sen. Bob Corker, R-Tenn., is seen leaving the Senate floor in the Capitol on October 24, 2017. It was just two weeks ago that Corker expressed frustration with the entire "redesign" process. "I don't think they're anywhere close to having a plan to present relative to the reforms that they want to make there," he said, calling a recent progress report "very unsatisfactory."